"Since the fishing lure industry’s meager beginnings around 1902, lures have come and gone by the tens of thousands. From the absurdly bizarre to the notable, and crazy baits with ridiculous monikers like the Crab Wiggler, Baby Vamp, Musky 5 Hook, Surface 6 Hook Lure, Alger’s Minnow, Spin-Divers, Neverfail, Wotta Frog, and Case Rotary Marvel. All promised fishing nirvana, only to fade into historical irrelevance. Read More on the Outdoor Life website. I remember all of these lures. My favorite lures of all time were lures from this article. As a child, most of our fishing was done in the late afternoon, after Dad got home from work. The Arbogast Jitterbug was always in Dad's tackle box. 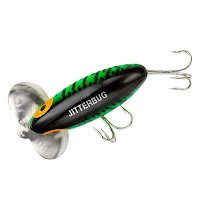 Right at dusk, the Jitterbug would entice huge and violent strikes from the Largemouth Bass we were targeting. At times, the bass would attack the Jitterbug with such velocity the fish would come completely out of the water! 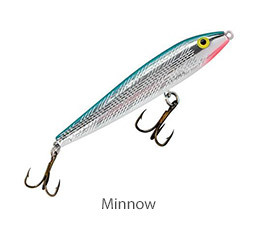 After the Jitterbug, came my other favorite lure the Rebel Minnow. That was my go-to lure in the late 1960's. I don't think there has since been a hard plastic lure that performed better for me.